Our whole school had a very successful trip to M&Ds kindly hosted by the Variety Club. Children all enjoyed the atmosphere, rides and treats that were available. Some children (and adults!) being brave and trying new rides…..some of them got soaked! Our Senior class went out to a Boccia Tournament at the Citadel in Ayr and participated really well in the sport. Their teacher was so impressed at how well they represented the school that they were all awarded ‘Stars of the Week’! Kerry Dair came to our Assembly to present our senior pupils with their Dynamic Youth Awards. Three of our Senior pupils worked on their food safety skills this week. Thanks to Suzie for working with them and presenting their certificates. Primary B attended a basketball coaching session with local primaries and got to practise new skills. They worked on bouncing the ball and target practice. Well Done! 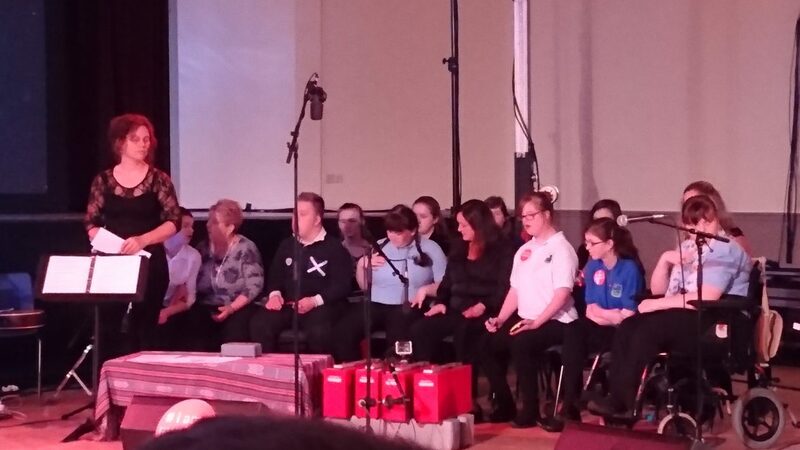 On Friday, 30th September our senior pupils put on an excellent performance as part of the Cumnock Tryst Music Festival. For weeks before this group of young people, supported by their class team have been, composing and rehearsing music using soundbeam technology with great support from Matilda at Drake Music. The rest of the school came to watch and it was a wonderful afternoon of music and storytelling.